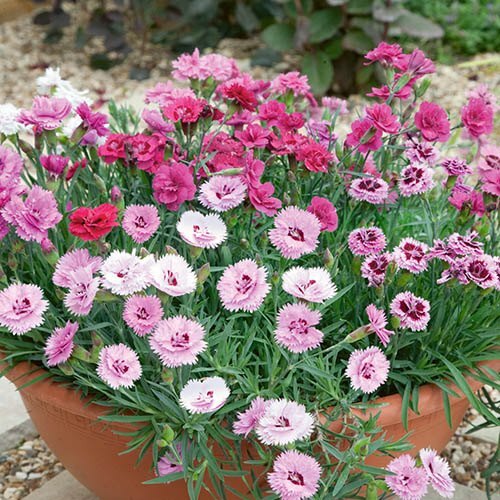 Classically fragrant Pinks are a cottage garden favourite and deservedly so! Perfectly winter hardy but ideal for a sunny bed or border, so easy to grow! Flowers from May until October. Contains 3 plants each of 4 stunning varieties: Cranmere Pool ,Doris, Letitia Wyatt and Mrs Simkins. Supplied as 12 garden ready jumbo plug plants, 3 of each variety listed. Classically fragrant Pinks are a cottage garden favourite and deservedly so. These varieties represent the best of the varieties that have stood the test of time for many years, and become a garden favourite all over the world - with that irresistible old-fashioned fragrance it's not hard to see why. Their wonderful clove-fragranced blooms look lovely in the garden, and will flower throughout the summer months but will also be perfect for taking as cut flowers for indoor displays. The plants will form lovely dense clumps of evergreen foliage that will provide great ground cover with a succession of beautiful fragrant blooms rising up above the rosette of leaves and showing themselves off. Perfectly winter hardy but ideal for a sunny bed or border, these easy to grow plants will establish and thrive for years to come. Flowers from May until October, cut them for the vase just as the buds break colour, for long-lasting fragrance indoors too! Supplied as 12 jumbo plugs (2.5 - 3.5cm diameter), 3 of each variety listed. Continued deadheading will ensure flowers right up to the first frosts. Give your plugs a little attention on arrival - unpack them immediately, and either mist them or stand them in water for an hour - they may be slightly dry or yellow after being in a dark box in the post, but they’ll quickly recover.